A simple but effective tool to save water & water new trees. The Tree Gator has been a very common sight in my hometown this Summer. I live in Vancouver, BC and we’ve been experiencing an extreme drought this year. Currently we’re at Stage 3 of our water shortage response plan, which bans all lawn sprinkling. The Tree Gator is a fantastic product that saves a lot of water, especially during times of drought. On top of that, the Tree Gator was initially designed to effectively water newly planted trees and shrubs by providing deep water saturation via slow and even water distribution directly to the root area. 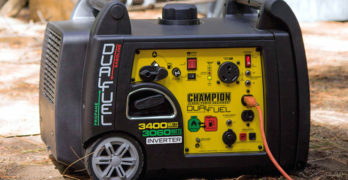 When using the Tree Gator you’ll find that there’s absolutely no run-off or evaporation. It’s so simple and so smart that I can’t help but wonder why more people aren’t using the Tree Gator. Perfect for new shade or street trees. Minimizes transplant and drought shock. Fast to set-up and easy to fill. 100% water absorption with zero run-off. Reduce your time spent at your trees by up to 80%. Can be used with water-soluble nutrients. A small tree with a trunk between 1 to 2-Inches only requires one fill per week. A tree trunk that’s 2 to 3-Inches in diameter = 2 fills per week. There are other watering bags on the market that look similar, or claim to work as well (or better) than a Tree Gator Slow Release Watering Bag. The truth is that TreeGator has been used by professionals worldwide since 1989. If you’re a reader of Chainsaw Journal you probably already know that the reputation and history of company and product truly do matter to me — as they should matter to you. Great products stand the test of time, and these Tree Gator bags have done just that. Learn more about the Spectrum Products, the company who makes the Tree Gator line of watering bags. Other than the important benefit of saving water, the Tree Gator is device designed for deep watering trees, which is also the best way to reduce the effects of transplant and heat shock in newly planted trees or shrubs. Can be used by homeowners or city municipalities. Watering the traditional way frequently by hand or with a hose or sprinkler is an inadequate (and wasteful) method of watering your trees. Why? Because the majority of the water you use is lost by run-off or evaporation. These inefficient methods don’t allow the root zone to be saturated properly. Let’s be honest, using a hose or sprinkler is inadequate for watering trees. In a world where drought is increasing and temperatures are generally rising, you may find yourself in a situation, such as my current situation in Vancouver, Canada, where watering is against the law for periods of time. So, instead of letting your trees die, you can wrap your trees in TreeGator’s and keep them healthy throughout Summer. The Tree Gator will prevent these ugly symptoms of tree decay. Symptoms of drought damage to your trees can occur quickly or may happen gradually — taking up to two years to become apparent. Symptoms of drought damage will reveal itself in your tree leaves which include: Wilting, curling at the edges, and yellowing. Deciduous leaves may develop scorch, brown outside edges or browning between veins. Evergreen needles will change color, such as yellow, red or purple. The needles may also become brown at the tips and browning may progress further through the needle towards the twig. In a long-term drought further changes will develop. The leaves may be smaller than normal, fall prematurely or stay attached to the tree even though it’s brown. Don’t be fooled. Heat stress may not kill a tree outright, but it will weaken it to the point where it becomes highly susceptible to insect and diseases over the following years. One of the initial symptoms of heat-stressed plants is the loss of turgidity which causes plants to become limp and droopy. Simply zip the bag(s) around the trunk of your new tree, fill it with water, and walk away! That’s it. You don’t need to dig any trenches or holes. No stakes or spikes to drive into the ground. Tree Gator saves you time, water and money. If you live in a cold climate, you’ll need to remove your Tree Gator and empty it once the cold weather arrives. As you would expect, the TreeGator is not suited for freezing cold temperatures, so make sure you remove it from your trees before the Winter season. After a few years of growth, young trees will have an established root system and they won’t require the tree gator any longer. Although, it’s still an excellent product to have around for times of drought and overall dry conditions. How often should a TreeGator Original Bag be filled? The Original Tree Gator water capacity (in gallons) is based on bag setup and trunk diameter (tree caliper). See below. Recommendations are based on 10 gallons of water applied per 1″ of tree caliper. View or download the DETAIL SHEET for the Tree Gator. Learn more about Tree Gator directly on their website. Slow release watering bag for trees. Designed for newly planted shade or street trees with trunks up to 4″ in diameter. Delivers deep water saturation. Helps to prevent transplant shock and drought (heat) stress. Eliminates water waste due to run-off and evaporation. Re-fill once ever 5 to 7 days. Designed with trees and shrubs with low branches. The Tree Gator Junior Pro is designed with a low-profile which enables it to fit under plantings with branches beginning only 6″ from the ground or higher. Thankfully, they’ve made it brown so it blends in with the surrounding landscape, namely dirt. The material is a durable PVC. Ideal for use on newly planted trees, evergreens & shrubs with trunks up to 6″ in diameter. Brown color and low profile creates a natural look. Dual PVC provides a continuous water supply over a 5 to 8 hour time period. Reduces transplant shock and heat stress. Easy to fill and use. Set it and forget about it. As the weather patterns continually change, you’ll likely be seeing many more of these Tree Gators in your neighborhood. I happen to live in a rainy part of the world and I see these tree bags everywhere now. If you live in California, you should probably stock up on these. The TreeGator being used by the city. Why is deep watering new trees important? Newly planted trees have an inferior root system that makes the tree fragile and in need to consistently applied deep water saturation. Transplanted trees are also vulnerable due to the shock from being removed from the ground. Deep watering with the Tree Gator keeps water and moisture levels deep below the surface where it can be readily absorbed by the tree roots. This reduces transplant shock and provides a newly planted tree the moisture it needs to grow downwards deep into the soil. Experts recommend deep watering your trees to a depth at least 12″ or more. The majority of a trees root system is located within 2 to 4 feet of soil. The Tree Gator is ideal for newly planted trees because it delivers water exactly where it needs it — directly over the root mass. Best Way to Achieve Deep Water Saturation? The best way to ensure deep water penetration is to gradually and evenly apply a high volume of water in a single application. 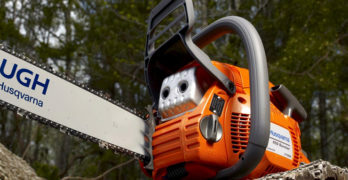 The Tree Gator does exactly what experts recommend and that’s why it’s such a commonly used tool for homeowners. The Tree Gator does exactly what a tree requires for healthy growth. It slowly and evenly delivers a high volume of water over an extended time period achieving deep water saturation. Fact: Trees need a lot of water. New trees can require 10 gallons of water per week for every 1 inch of tree caliper (trunk diameter). While there is no standard watering amount that is suitable for all new trees, there are general watering guidelines that can be followed. One commonly used formula suggests 10 gallons of water per week for every 1 inch of tree caliper; For example: A single 2 inch caliper (trunk diameter) tree would require approximately 20 gallons of water per week. The original Tree Gator and the Junior Pro version. 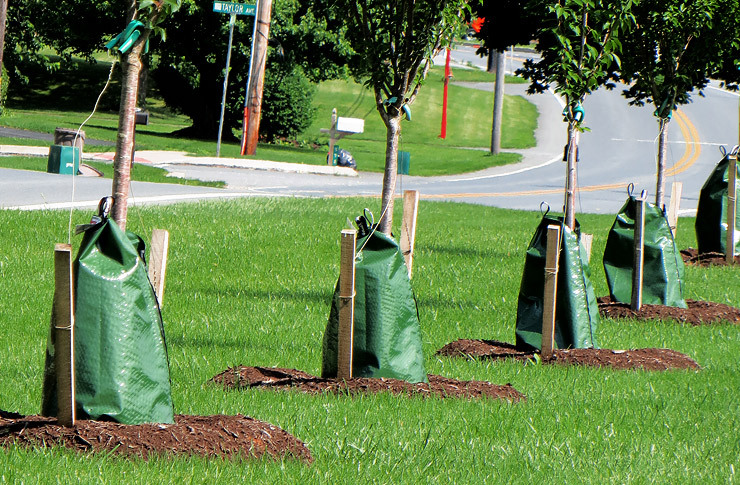 A Tree Gator bag will apply 15 to 50 gallons of water in a single application (depending on model and bag setup). Why not just water frequently with a sprinkler? Watering a tree with a sprinkler is ineffective, even on a regular basis. Unfortunately, with the sprinklers, the majority of the water applied will be lost to run-off and/or evaporation. What most people don’t realize is that light and shallow applications of water will force roots to the surface, leading to shallow rooting and poor root anchorage. The Tree Gator actually forces the tree roots to grow deep into the ground because it delivers the water deep into the ground. It’s a simple mechanism that works. Remember, roots grow where the moisture is, so if the moisture isn’t deep in the soil then they will grow shallow, leading to weak tree. Newly planted trees need a lot of water because they have inadequate root systems and are less effective than established trees at absorbing water. It can take several years for a transplanted tree to re-establish its root system. On average, a tree requires 1 year for every 1 inch of trunk caliper (tree diameter). Select an appropriate tree for your location. It needs to have ample room — vertically and horizontally — for the canopy and roots to grow. Dig a square hole no deeper than the root ball. This prevents the roots from settling too deep, allowing them to penetrate the surrounding soil. Prune the tree sparingly, only if necessary. Set the tree in the hole with the root collar flush or slightly above natural grade. Carefully fill the hole with the same soil that came out of the hole. Mulch around the tree at least out to the drip line, 2 to 3 inches deep and up to, but not touching the trunk. Wood chips, pine bark, leaf litter and hay are excellent mulches which keeps the soil temperature steady, increases soil moisture retention and prevents weeds from taking hold. Organic mulches are better as they add nutrients to the soil as they decompose. Water the tree for the first 1 to 2 growing seasons via a thorough soaking every 5 to 7 days using a Tree Gator Bag. Protect the tree from vandalism or animal damage. Do not fertilize the tree during the first growing season. If necessary, use tree-specific fertilizer or root stimulant. Too much nitrogen will burn fragile roots, slowing growth and delaying establishment. A great natural solution to keep newly planted trees healthy. Superthrive is recommended to transplant trees, improve crop yield, and grow healthy lawns. Can also be used with indoor and outdoor plants.